Your email newsletter might be the one way you keep contact with your company's audience. Keep the conversions coming with these simple split test ideas. Your company newsletter might be the one way you keep in touch with your audience. Is yours really reaching subscribers, encouraging them to visit your site time and time again? It's a great idea to test your email newsletter: trying out different techniques to see what resonates. These simple split test ideas can subtly (or drastically!) update your newsletter, bringing more conversions and engagement from your subscribers. First, a note on A/B tests: Split testing really only works when you isolate one variable to change per email send. While these are all great ideas for testing, stick to one test at a time. That will help you figure out if that variable itself really had an impact. The subject line of your newsletter is the holy grail for a great open rate. All your subscribers get to judge your email by is one line: it compels them to either click or to hit the "delete" button. Try different variations of subject lines for your email newsletter. Do you want to be predictable, and say "Hi Sarah, here's your monthly newsletter from Company ABC!" or do you want to use an article title in the subject line? Test different phrasings in your A/B sends, and replicate what resonates. To get started, personalize your subject line for an A/B split test. Emails with personalized subject lines are 26% more likely to be opened, according to Campaign Monitor. The personalization of my name makes it pop out from the rest, and the "I'd like to invite you..." makes it feel like a personal email. On the other hand, your audience might find that a little too informal — an A/B test can show you how effective personalization tokens are for your newsletter base. Speaking of personal email, who is your newsletter coming from? If readers get an email from newsletter@companyabc.com or from "noreply," they might not feel as compelled to click — or they can even perceive your email as spammy. In fact, 43% of email recipients click the Spam button based on the email “from” name or email address, so make yours count. Test out using an actual human's email address in your "from" line on an A/B test. I love receiving updates from Unbounce because they're sent by a real human. As another personal touch, the the email message is always in the voice of the sender: Here's what we tried. And while it may be compelling, don't use a "no reply" email. It's better to use your real address, so you can encourage conversation and take questions from your audience. Are you using images in your email newsletter? Try a send without any images, and vice versa. It can have huge impact on your engagement rates. There's a case for both image-heavy vs. image-light, but one compelling statistic from Litmus says that almost half of Gmail users don't see images in their emails... which could really throw off the intended aesthetic of your newsletter. People tend to self-report that they prefer images in email, but State of Inbound 2016 data suggests that text-based emails actually perform better. How can you find out what's right? Test it out on your subscriber base. 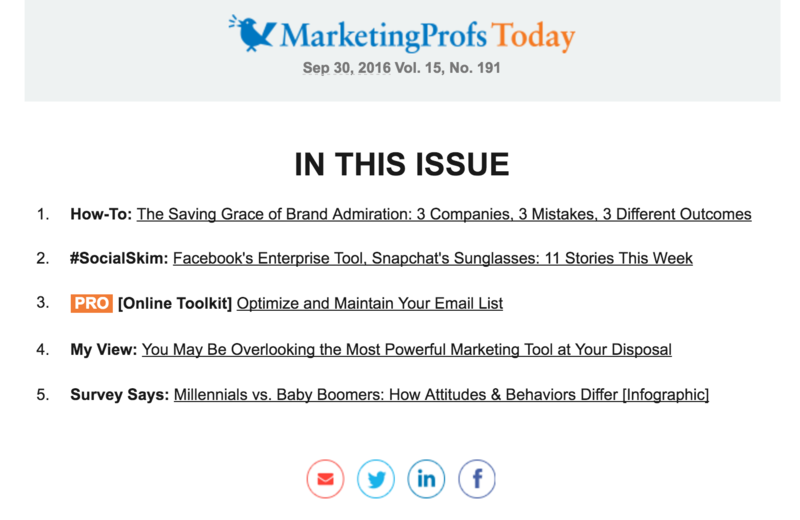 Send the same newsletter to two separate groups — one with images accompanying your content, one with text only. If you do find out that images are your best bet, make sure all your images are sized appropriately and that they have alt text in case some recipients can't/won't load them. There might be a lot you want to share in a newsletter — but what's the right amount of content for your subscribers? In this example, MarketingProfs is sharing five different links. They have a table of contents at the top of the email, and then they elaborate briefly on all the articles below. Other companies take one article or offer and really expand it into an in-depth teaser, like this newsletter below. Each technique has its pros and cons. Highlighting one article gives your readers a clear next step: "Click on this link to read more!" It streamlines the actions they can take, which can put pressure on the click. According to WordStream, emails with a single call-to-action increase clicks by 371%. Note: If you do use multiple articles, HubSpot suggests you use 90% educational content and 10% promotional. If you don't have enough educational content in your arsenal, you can curate links to outside articles from the web that you enjoy. Test out sends with one article vs. a few. 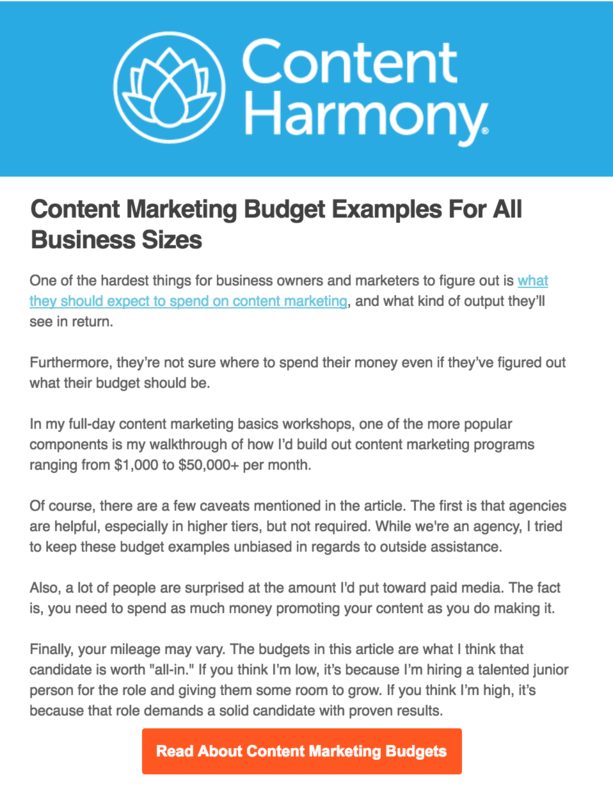 You can also experiment with different amounts of content (3 pieces per newsletter? 5? 10?) to see what sticks. Time of send can be really important to your open rates and engagement. If you're sending at a busy time, like 8 a.m. local time, you might be competing with a lot of other marketing messages. But send too late, and you might miss the mark — I rarely read my Wired Magazine newsletter because it comes at after 4 p.m., and I'm mentally checking out of email at that time of day. This is where testing is key to nailing down that sweet spot. At SparkReaction, we've seen improved open rates with this approach, since our subscribers hail from all across the world — and who's really going to check an email at 1:30 a.m.? 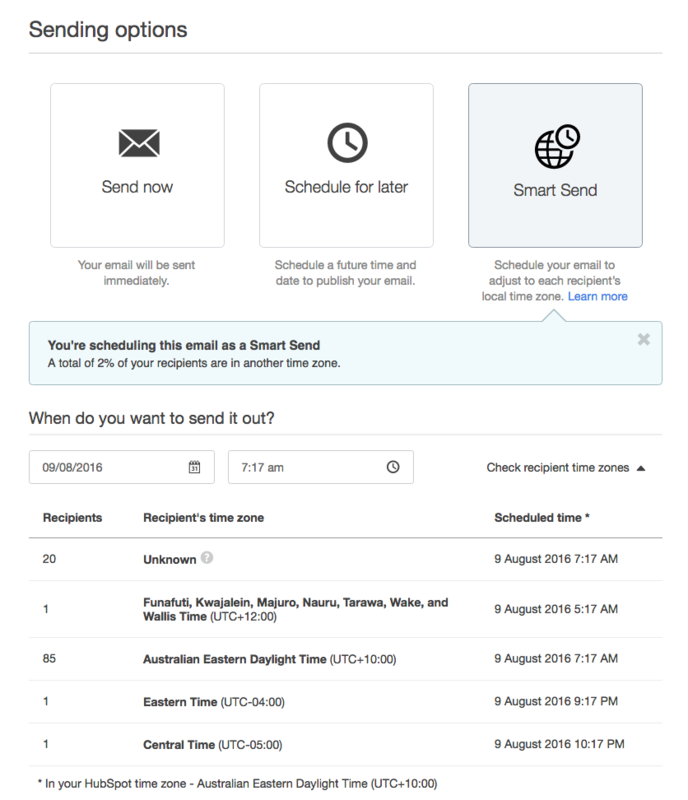 If available to you, you can test the same email to two different lists: one with a "smart send," and the other at a fixed time. Queue up the same newsletter to two different lists (in the same time zone), and send each one at a different time. With a few split tests, you'll get an idea of when people want to see your newsletter in their inboxes. Like the time of send, the weekday of send can matter significantly, too. For best day of week to send email, you're shooting for that period when inboxes aren't too saturated, but email checking is still relevant to readers. You can find a lot of stats, forums, and anecdotes claiming that certain days are the better choice for newsletter sends. The truth is, your industry and audience is unique. You won't find out what's best until you try it — and that's the beauty of the split test! If you're sending business-related emails, weekdays are generally better suited for your newsletter. If your newsletter is more consumer-focused or entertaining, the weekend might be better, when people are enjoying downtime and actively shopping. Let your audience be the final decision maker with an A/B test. How often should you reach out with a newsletter? 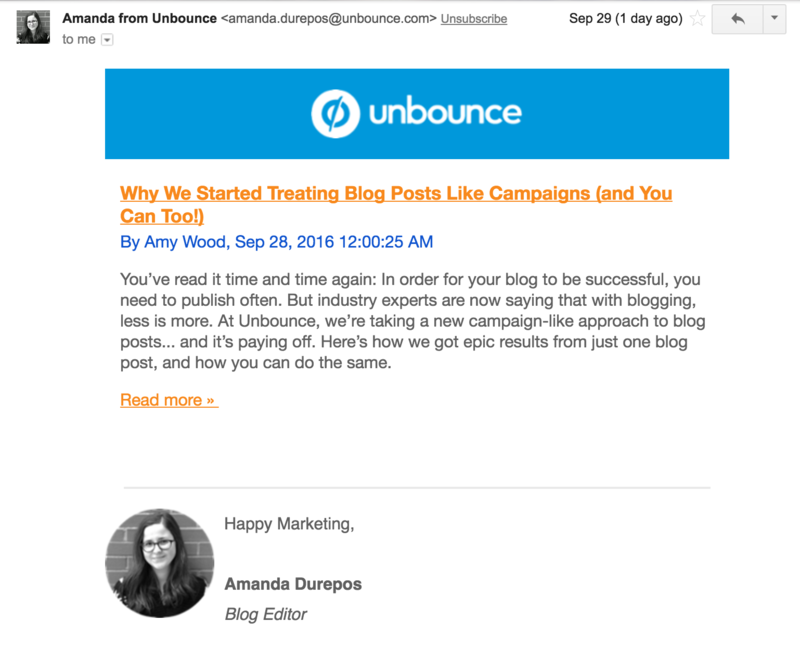 Unbounce significantly cut back on email frequency, and they saw a huge spike in engagement. Sometimes too many emails can fatigue your audience. Overdo it, and you run the risk of sending "grey mail," or emails that just sit in the inbox gathering dust. On the flip side, your audience might want more content from you. If you're not publishing enough, you could be missing out on opportunities to engage and convert your newsletter readers. A test can tell you how often to send your emails to maximize engagement. Send your newsletter at a different frequency to half of your list, for example, twice instead of once weekly. After adequate time has passed, analyze the engagement of this list against the original. When you tease an article in your newsletter, how do you format your "read more" text? Is it a text link, a button, or an image? We've already talked about how images can disappear in email, so that might not be your best idea. But what about text? Studies show that a simple button over a text can increase conversion rates drastically. Copyblogger found that button CTAs had a 45% boost in clicks — like this example below. Consider creating a button vs. a text call-to-action test in your next newsletter. You can also split test a few different variables for your call-to-action button. You can experiment with its color, although studies have shown that size of the button and its placement in the email are both more important factors. This could be one of the simplest ways to boost your newsletter conversion rate, so split test text/button, then different colors, sizes, and placements in your newsletter. If you've got the power of automation in your toolkit, you can segment your contacts list based on many different factors. You can create lists of people who are interested in Topic A over Topic B, and use that information to curate separate newsletters. 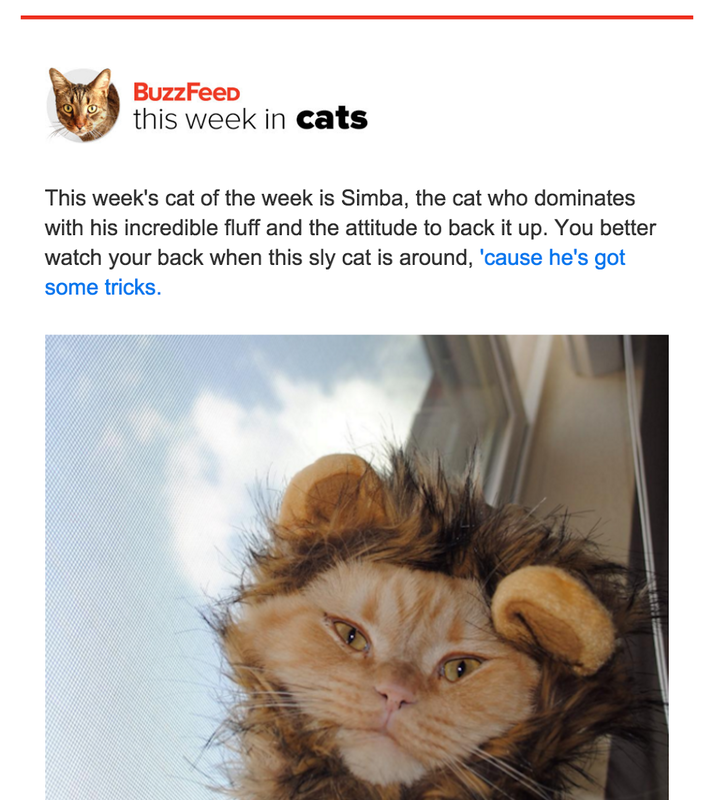 Buzzfeed, for example, sends out newsletters solely about cats to people who've indicated they're interested. It's a goofy example, but think: How can you use segmentation in your own newsletter? Segmented and targeted emails generate 58% of all revenue, according to DMA. Consider creating a list of subscribers who have a particular interest, and sending them a unique newsletter curated to that interest. For example, if you sell luxury watches, you could create one newsletter based on watch technology and another based on watch fashion. To test its success, send your niche newsletter to a segmented list and also send it to a more generalized list. If the segmented list has better engagement, you can make a case for continuing segmented newsletters. They might be more work, but if the returns are solid, it's well worth it. Split tests are only as good as the data you crunch afterwards! A marketing automation tool like HubSpot can let you create split email tests with ease — and avoid other email problems, like remarketing. Otherwise, you can do separate sends on your own using your email tool, like MailChimp. Just pay keen attention to performance, and remember to only test one variable at a time. With continual improvements to your newsletter, you'll be growing your subscriber base, converting your audience into leads, and continually moving your audience down the funnel. Want to learn more about how content can work in an inbound marketing strategy? Sign up for our free, bite-size email marketing course. You'll learn to generate inbound leads at your company in 9 easy lessons. Kayli is the keeper of the SparkReaction brand. She oversees the marketing strategies for SparkReaction's social media presence, website, blog, and e-mail marketing campaigns. She produces and designs content that is engaging, optimized, and beautiful.